Below you will find complete details about becoming a licensed Florida Swimming Pool and Spa contractor. We understand that the details about how to get started can be difficult. If you have any questions, please contact our helpful Career Counselors at 1-800-732-9140. We are happy to assist. The Gold Coast School of Construction is the leader in construction education for both Registered County and State Certified contractors. Students enroll with Gold Coast because they have one goal, to pass the state exam! Our curriculum, methods, and team of experienced instructors are dedicated to help every student achieve that goal. We understand that anyone can claim to be the best school in Florida, but we can prove it. The Gold Coast curriculum is an in depth review of all state examinations topics. Our materials are continuously updated to reflect exam and code changes, and are direct, yet simple to understand. Our instructors are licensed practicing professionals including Contractors, Architects, Engineers, Building Inspectors, and OSHA trainers who care about your success. Gold Coasts Exam Prep program is offered in two formats, the Full Service Contractor Exam Prep and our Basic Contractor Exam Prep. These prep courses are designed for contractors who are serious about passing their exams and getting started with growing their business. This is a classroom based exam prep program. Enrolled student can attend unlimited evening classes and weekend exam reviews sessions during their 1 year tuition period. Classroom instruction one night a week from 7:00pm-9:30pm. The last two weeks of the month will cover Pool Trade Knowledge and is only offered on Monday nights at the Broward campus. Bring your questions and we will show you how to work through to the answers together. Your tuition is valid for one year allowing you to take as many classes as you would like during this period. Exam reviews are in-depth reviews of exam style questions and scenarios and are designed to drive home the key topics needed to be successful on the state exam. This is a home study exam prep program. The Basic Contractor Exam Prep Program provides all the information and materials needed to help you pass the exam, but requires far more individual effort and discipline when it comes to reading and studying. If you learn best from live classroom based instruction, our Full Service Package is designed for you. To register online, use the drop down menu in the “Schedule Your Course” box above, click on the “Register Now” button next to the course offering below, or contact our helpful Career Counselors at 1-800-732-9140. We are happy to assist. Simply register for the month in which you plan to start and your tuition will be valid for 1 year. There is no limit to the number of class sessions that you can attend. If you do not meet the 660 FICO score, you CAN still get your license by posting a licensing bond. Bond amounts vary based on whether the applicant is a Division I or Division II contractor, however this amount can be reduced by 50% upon taking a board-approved financial responsibility course. Gold Coast offers this course in addition to our exam prep programs: Learn more…Click Here! 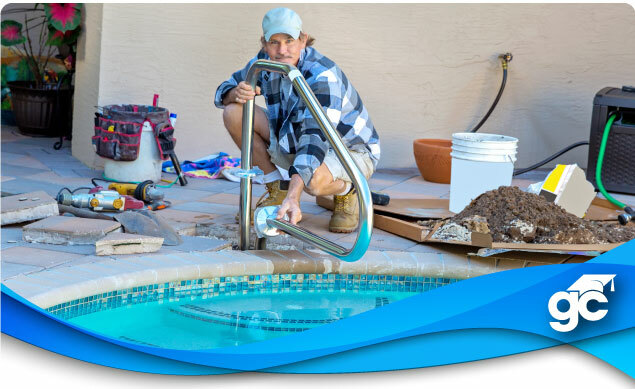 For Swimming Pool/Spa Contractors, you must have been a foreman or supervisor that was involved in all aspects of construction, repair, water treatment and servicing of commercial/residential pools.